Poor reception is the bane of many users of cell phones and smartphones. When you’re trying to talk or access the Net, few things are as frustrating as dropped call or a balky data connection. There are devices that can help. For some time, consumers have been able to buy cell signal amplifiers that work on any carrier. They pick up weak signals and amplify them – both to your handset and back to the nearest tower. They’ve been largely available without restriction . . . until now. 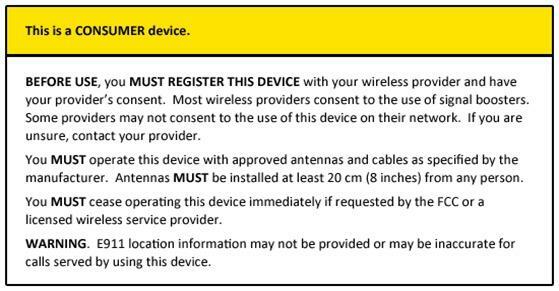 On Wednesday, the FCC issued new rules that require owners of cell signal boosters to register the devices with their respective carriers. Those not willing to register the devices must turn them off. The four major carriers – AT&T, Sprint, T-Mobile and Verizon – have promised the FCC they’ll create simple and “reasonable” systems for registering the devices, although those procedures aren’t yet in place. What hasn’t been indicated, though, is whether cellular customers will be charged for the privilege of improving their carriers’ weak signals. What’s most interesting about the ruling is that cell signal boosters must already meet stringent FCC anti-interference requirements in order to be sold at all. The ruling implies that the regulations aren’t doing their jobs.
. . . Besides charging monthly fees, Calabrese said carriers could strike exclusive deals with device makers to make sure they get a cut of each device sale. That said, the FCC’s order does call for “a free, simple registration procedure” to encourage compliance. If the carriers charge for cell boosters on their networks, fewer people will voluntarily register. Chances are, no one is going to come knocking on your door tomorrow if you have an unregistered device – unless it is indeed causing interference. But at some point, carriers and the FCC will begin enforcing this order and you’ll need to register with your carrier if you want to keep using it.